Looks like an awesome stroller. Perfect for my 2 year old daughter. Looks like a great stroller. Thanks for this chance. This would be a great stroller for my youngest grandson to use! I love that it holds up to 50 lbs! this stroller would be amazing for my family. thanks for the chance! This looks like a wonderful stroller. This stroller looks really nice. I love the stroller. We are needing a new one. love that this stroller goes up to 50 pounds!! most dont go up that high! plus its lightweight!! would be perfect to store in my trunk for walks and mall days! Wow this stroller seems like a lifesaver! I’ve been looking for a lighter-weight solution! Love that this stroller goes up to 50lbs! Plus have a click connect car seat so it’s perfect! This would be a perfect shower gift! My son has a new baby on the way. They could sure use this. This looks like a nice stroller! We will be needing one soon! This Graco stroller is great when the ‘little feet’ get tired! I really like the Click Connect concept and I have been looking for a great stroller for a certain someone who is due in a few weeks. Hope I win! I love these baby items. I could really use them especially the stroller. Graco has always made quality products. In often keeping 1 of my 4 grandbabies, all under 3 years, the one thing I do not have here is a stroller and somehow, it is always forgotton to leave me one. This would be great to have for when any of them are here and we go for a walk. I could take them out much longer. This would make an amazing shower gift!! I love that there is click connect on this compact stroller. It would work great with my 2 year old and soon to be newborn. I’d love to be able to give this to my nephew and his wife, expecting their first baby in a few months. Looks very compact & easy to travel with 🙂 Which we love. This would be awesome to win!!! It’s so versatile that it can grow with the child. I cannot use it but it would be the perfect addition to my younger sisters lays the she due in November but I cannot afford such a beautiful gift. I am going to keep my fingers crossed. Graco is awesome, we had two of their deluxe travel systems. But… There comes a time when the lightweight strollers are the better decision! I like that you can fold this stroller easily and that it is lightweight. I want this for a new grandbaby. I would love this for my LO! This is an awesome addition to baby items! This looks like a great list weight stroller. It would be perfect for when I take my little grandson to the zoo and parks. This would be a great gift for my niece. Graco makes some handy products. This would be a perfect fit for my sister in law who is currently pregnant! This looks like a great stroller! Fingers crossed to win this for my little one. My sister is due in December.. this would be an amazing gift to present to her. Would love to win this for my sister who is due in November. Wow thanks for this oportunity. I just love the features that this stroller has, now i can take my kids everywhere. I would love to have this great stroller for our expected bundle of joy! This would be perfect for us! Love the look and design! This would make a great Welcome present for my soon-to-arrive grand-nephew! Graco rocks! Thanks for the blog post, Marino Bambinos! This looks awesome! I would love to win this for my nephew!!! I have heard really great things about this carseat. I love that it RF comfortably for a long time! This looks amazing! I love how easy it is to fold up. this stroller looks like a GREAT product! What a really nice stroller. My grand daughter could use a new one. Thanks for hosting. I love Graco and my babe would love this!! This looks like a great stroller. I love how it fits children up to 50 lbs! I’ve been considering the Graco Extend2Fit for my youngest. It would save me from having to buy new car seats as he gets bigger. I’d love to have the stroller as well. Thanks for the giveaway! Amazing products! Thanks so much for the chance! I really love the design! This would be perfect for my little boy! This stroller looks really nice. I imagine it will last a long time. It looks sturdy. Looks great and perfect for my 8 month old! I love the 3-in-1 car seat! it seems like it would be so easy to use and functional! I’ve got a bun in the oven and would love to win this and make life as a new momma a little easier! Is it silly that I got most excited at seeing the cup holder on the side? lol The stroller looks comfy to push around! I would love this for my sister! I love the big stroller basket — it’s an often overlooked but important feature. This looks like a great stroller/car seat system for our family. Looks so easy to do and comfy for the kiddos, too! The Graco Breaze Click Connect Stroller would be a great help for our family, we are expecting our sweet baby boy in Nov. We can’t wait to meet him in 3 months. We love the graco click connect products but don’t currently have a stroller that’s compatible with our infant seat. Would absolutely love to win this and put it to good use! A friend recommended that I purchase Graco brand, she said this brand is the best. My cousin just had her 2nd little boy, and this would be such a nice gift to give her! I have been using Graco products for over 30 years, and would love to have a stroller to keep in my car for the granddaughters! this is a really nice stroller. it would be a welcome addition to our household. I haven’t had a click connect before, feel downright old fashioned pushing our enormous ten year old stroller around! i would love to get this for my baby nephew! Grace brand has many good products. Be safe wherever you are. This stroller looks like it is really user friendly. I need all the help I can get as a soon to be first time mom! My hairstylist was talking about this a few weeks back. Very cool! This is perfect for my baby fingers crossed.? Thanks for hosting this giveaway! I love that this car seat is basically a three in one. This would be great for my nephew who will be arriving soon. Thanks for the chance! Would love to win this as the stroller we have is just slightly too big to fit inside the trunk of my compact car :(. This one would be perfect because it’d mean I wouldn’t lose the front passenger seat to the stroller every time we go somewhere! Thank you for offering such a great giveaway. This is such a great stroller – I love that it has a 50 pound weight limit and will last for years! Thanks for the chance to win this! I would love to have the convertible car seat! This looks like an awesome stroller. I love that it is so light weight, but can also be used as a travel system. It sounds great for every day use. This seems like an amazing stroller, that would be great for my little one! So much easier to travel when you can zip around with the little one! This looks amazing! I just love the design! I’d love to have it for my baby boy! I LOVE the stripes! Super cute and very chic!!! This would be perfect so I won’t have to lug around my huge stroller anymore! Perfect for my newborn baby girl! Looks like an awesome stroller. Perfect for my niece. I love the super sized storage bag. This is such a wonderful stroller I would love one to use at the park when I go walking with the kids. I would love this graco stroller for my son! Great review! Grace products have always bedn my favorite, very safe and comfortable. This one would be perfect for my 22 month old son and for his sibling that’ll be joining us later! This would be awesome for my granddaughter who is ready for a bigger car seat! Would love this! Love that it’s like an umbrella stroller but nicer! The umbrella stroller I have doesn’t have a basket underneath like this one! Love it! Could really use this! My current stroller has definitely seen better days and an upgrade would be very nice! Thanks so much for the chance! As a city mom, I love extra storage space for all that walking. Loving the one hand fold and extra large canopy, the design is extremely easy on the eyes too! Love this stroller!! Thanks for the chance. Graco is one of my favorite brands. I will be welcoming my baby around christmas and graco strollers are what I’m looking for. Love that this can grow with the child, very versatile! I have an umbrella stroller that I use for my grandson. It is a cheap one, and doesn’t steer worth a darn. This one looks like it would work much better. Love that any type of car seat fits in the stroller. I LOVE the ONE HAND FEATURE & THE UMBRELLA! GRACO PRODUCTS are the very BEST! My daughter is expecting in 23 days and this would be perfect even for Gramma’! I want a stroller that is easy to use and maneuver. I would love this for my sister. It looks like a great stroller for a first time mom. It’s so hard to afford a good dependable stroller nowadays. Thanks for the chance! I would love to win this stroller for my sister. Thanks for the chance. Graco = Quality! This is the perfect stroller to have on board. Need a new carseat for my daughter! Thanks for the info! I love how light weight this stroller is and can still use a car seat with it!!! So much better than the one I have now! I’d love to win this for our baby girl, due in October! Thanks for the giveaway, ‘id love to win this for my little baby boy! Our neighbor has this stroller and it seems to be very well built and sturdy, would love to win this! I love that the car seat grows with your child. Love a new stroller. Thanks for the review. I would love to give this to my sister in law for her new baby. Its such a struggle to not have a stroller. This looks fantastic – and I love the canopy and storage space! Perfect for my niece! I love how compact and light this stroller is! Beautiful design, very classy instead of the typical whimsy. Love the tall handles. This stroller even looks gorgeous! Great stroller for my new grand child – coming soon. This looks like a awesome stroller thanks for the chance!! We only use graco. No other brand has their high quality. My brother just had a baby. This would be an awesome gift. I would love to win this stroller! Wow the Graco Extend2Fit 3-in-1 Car Seat – it sounds amazing and so cool the way it works! I love the stroller and really need one! We have a Bob, which I love, but it is really heavy so this woud be perfect to just have in the car to use whenever we are out and about because it’s so light weight. Thank you! I think this stroller would be perfect for our walks to the park. I love that the canopy has UV protection. This would be the perfect stroller for me to have for my grandsons. I have a 6 month old and my daughter is due in a couple months. I have several struggling cousins and other friends struggling to get all the items they will need once the babies arrive. Something like this would be great cause if one of them can’t come up with it then it will be able to be gifted from me to them. Thanks so much. This would be so great to have it has so many useful features! My brother and his wife welcomed their daughter into the world less than a month ago. I would love to be able to gift this Graco stroller to them. It looks great! Thanks for the chance to win. i really like that stroller! It is great that the stroller can hold up to 50lbs! 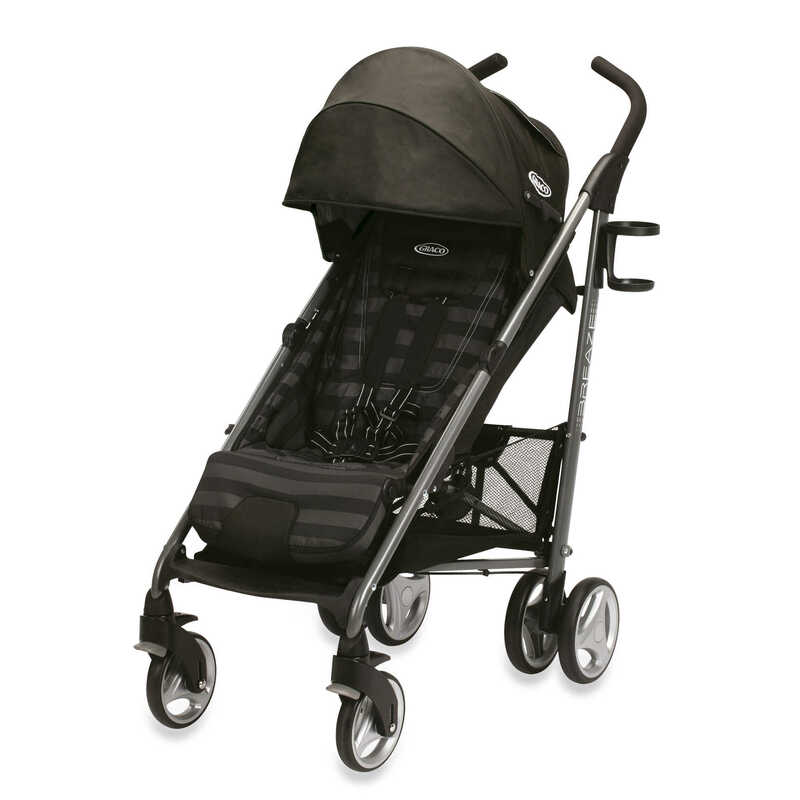 I love this stroller its lightweight and i love the convertible top! Baby boy number three is due in just under two weeks, this would be SO awesome to have for him! This is a mice stroller, lightweight and practical. We are having our first grand baby and I would love to have a stroller that will last. id give this to my friend with hetr 2 mo old. This would be perfect for the grandbabies. I would love to give it to my step daughter. I would love to win this for our baby due Nov. 8th. Thank you for this opportunity!!! Graco makes the best products. This would be perfect for my daughter. The six position recline is nice! Love the idea that there is room to grow. I commented on the handwriting post. I enjoyed reading your review. This would make a great baby shower gift for my niece. This is really an innovative product. I am very impressed. Strollwr looks amazing. My sister would love it. I love this stroller and the ease of using it. this would be perfect for my toddler! I love the one handed folding on this stroller, it looks like it is lightweight and easy to travel with. I would love to win for my daughter who is due in March with my 2nd grandchild. so excited!! They have a really good product line. A good stroller is so worthwhile. This stroller would be awesome for my granddaughter. Great review, this would be perfect for my daughter. I’d love to win this amazing stroller. I would love to win this for my son. The stroller looks like the perfect size for maneuvering through stores at the mall, and sturdy enough for outdoor use. I’d love to trade in my oversized stroller for something more streamline like this. Looks like a great stroller and could use with my grandchild. We could really use something that is so sturdy and portable (that one-hand fold!) since we don’t use the car much. The storage basket is so important, so you don’t tip over the stroller. I like the size of the Graco’s basket. I love that you advocate extended rear facing! I love the one hand fold. This stroller would be great for us. We need something lightweight and easier to maneuver for me and my two girls. I’d love to try it out. I like the overall design of this stroller. I’d love to win this for my friend who just had a lil one.